The new Nikon Monarch scopes have been eagerly anticipated. Now, finally, we expect the first shipments to hit dealers’ shelves the first week of July. We are especially interested in the new 6-24×50 side-parallax Nikon. SWFA.com and The Optic Zone have priced this scope at $629.95 (Nikoplex reticle), making it hundreds of dollars cheaper than a Leupold 30mm 8-25×50 LRT. The new 6-24x Monarch could be an ideal varminting and general purpose target scope. It features 1/8-MOA clicks, 1″-diam. one-piece tube, 34 MOA elevation, 2.1 mm exit pupil, locking side-focus parallax adjustment, and near-constant 3.6-4.0 inch eye relief throughout the zoom range. Nikon has created a new website showing off the features of all the new Monarchs, including the 6-24×50 and the 5-20×44 zooms. Click HERE to visit the new Nikon Monarch preview website. Share the post "Preview of New Nikon Monarch Scopes"
During a summer prairie dog expedition, a serious varminter may shoot hundreds of rounds in a day. Value-priced components help keep a shooter’s budget under control. As a June Special, MidSouth Shooters Supply is offering 50gr and 55gr bullets in economical 500-round packs for just $34.74. That works out to just $6.95 per hundred bullets! These .224-caliber “Varmint Nightmare X-Treme” bullets feature a flat-base design with a soft point lead tip for good expansion. 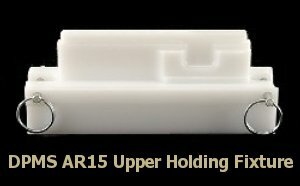 Share the post "Super Deal on Bulk .224 Varmint Bullets"
Share the post "AR-15 Upper Holding Fixture on Sale"